I photographed this "starship enterprise" at Farnsworth Banks, Catalina Island. 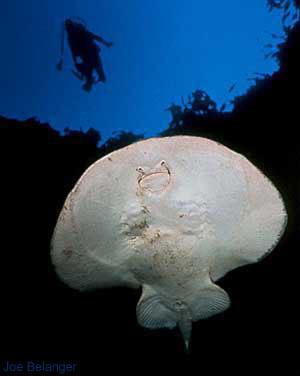 Although the Torpedo Ray is usually a nocturnal feeder (night feeder), this one was swimming in open water at 11:00 a.m.. It seemed to like my exhaust bubbles and hung around my head for a few minutes, allowing me to shoot this picture. 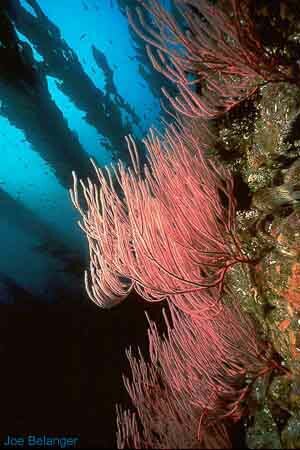 I took this picture in 130 feet of water during a somewhat drab dive. I came across these spotted turbots and swam with them for awhile. I ended up planting my camera firmly on the bottom to get this perspective on these flat denziens of the deep. As one swam, the other followed, so I was lucky enough to get both framed in the same picture. 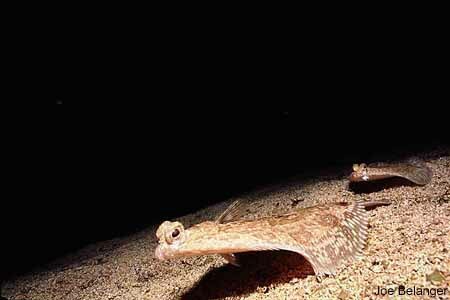 About the Spotted Turbot: Common inshore to 150 feet. They range from Morrow Bay to Baja California, Mexico. Size to 12" (.33 m). 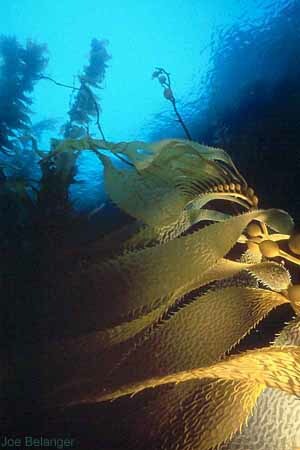 Photographed at Ship Rock Catalina Island using a Nikonos V and 15 mm lens with one strobe set at high power and held to the side of the plant. Exposed at f11.